Get the rah-rahs going with the cheerleader with purple uniform personalized Christmas ornament that arrives with a display cord and our plush velvet pouch. These sports ornaments personalized with each girl's name are great gifts for the cheerleader in your family or the entire squad. Other uniform colors are available, and it's offered in blonde and brunette Caucasian models too. 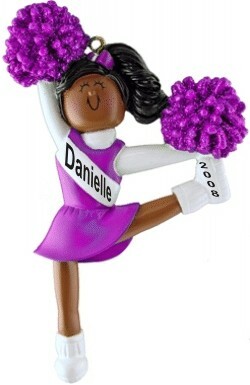 Build team spirit or celebrate a successful season with the cheerleader purple uniform African American personalized Christmas ornament and others like it.